Tube complement: 14C7 RF, 14Q7 mixer/oscillator, 14R7 IF/detector, 14A7 1st audio, 35L6GT audio output, 35Z5GT rectifier. Ick! Another loktal-tube set. 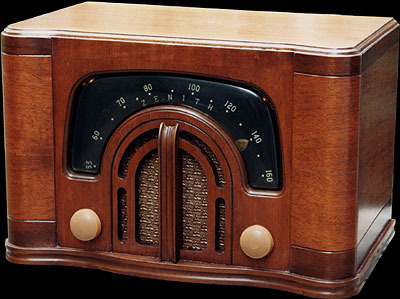 On the plus side, this radio has the deluxe, six-tube AC/DC-type circuit, with the added RF amplifier for better sensitivity. This Zenith design goes even further by providing a three-section variable tuning condenser. The third section tunes the plate circuit of the RF amplifier stage for better selectivity. From the 1942 Zenith brochure. 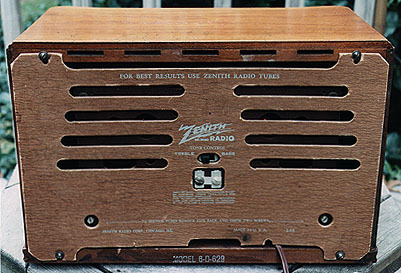 Some excerpts from the brochure extolling the virtues of the 1942 line of Zenith table models.